In your sea kayaking experience, you can explore rugged and inaccessible coastlines, deserted beaches and picturesque inlets and coves. Discover secret low tide caves once only known by pirates and smugglers. 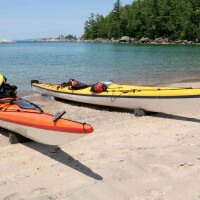 Available as a half day, full day or multi day activity, sea kayaking is not just for the experienced. Take an introductory lesson and see if this is for you. The sea kayaking experience can also include lunch or even dinner arranged by us - stop off for a BBQ at a remote beach or sometimes even a pub stop in a tiny secluded coastal village. We can arrange all the equipment, lessons, transport and even accommodation. Whatever you need we will take care if it.